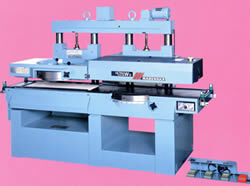 Feature The ROYAL 14FX, an open side type surfacer, is capable of working wider workpiece up to 350mm. 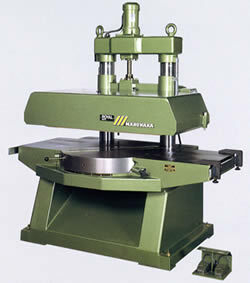 The turntable permits the bias angle to vary from 0º to 60º according to the workpiece. 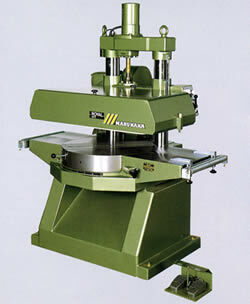 Feature To strengthen the workpiece feeding capacity, the ROYAL 18FX has an enlarged body of heavy-duty construction. With the workpiece feed area so expaned, the ROYAL 18FX is capable of cutting a 450mm wide work at the maximum with stability. Feature Top planing and bottom planing performed by one machine. Since two knives, one for rough planing and one for finish planing are set at both of the top and bottom, both sides can be planed with just one workpiece feed. Therefore, planing time can be shortened considerably. It can also be built into a line. Variable bias angle system permits to choose the optimum bias angle to obtain the best finishing for the workpiece according to its hardness and moisture content.